I bought a used SRT8 Magnum after wanting one for a long time, and then finding the right one. This one is perfect, low miles, and well cared for. The only weak point is the stereo, it just sounds terrible. This is the model with the subwoofer in the back, it's there and works well. Same with the rest of the speakers, they work well, but there is no mid-range, all low bass and tweeters, everything else is missing. In fact, it's all high range until you add enough power to get the bass to kick in. It sounds like a 70's clock radio with a bass tube! I thought something was broke but a guy at the dealership told me that these were known to have terrible sounding radios. I just can't believe that it would be this bad. Is there any known issues, or maybe a cross over that's failed? I just don't know anything about this car yet and I don't want to go through 2 years of bad music before figuring it out. I have a 2011 Jeep Grand Cherokee with the whole sound system, GPS, phone, hard drive, everything, and I love that system! I was hoping that I could swap it for one of those but I hear the U Connect makes it impossible to use. Any other suggestions? I live near Austin, TX if anyone knows a good shop. The local Dodge dealer is very good but he doesn't know anything about these radios. First.... welcome to the group from right around the corner! Post up some pics of that 08! Sent you a PM, mine has the same horrible stereo! I upgraded my 06 SRT from the Boston Ac. base system to the Kicker system. It's probably one of the best oem systems I've heard for that year production car. It wont win any sound off competition awards but for plug and play and under $500 for the upgrade it was well worth it. The 300 SRT has 3 tweeters in the dash, 2 two-way components in the rear deck , 10" sub in the trunk and 2 mid bass in the doors. Is that how the magnum is set up? 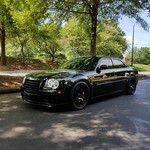 Being that the sub in the 300C is enclosed vs. the magnum being a wagon, might affect the way the bass sounds. Mine is nice and deep and vocals are extremely clear even at high volumes. Yep, same issue with 06 msrt. I installed the upgraded amp 77kick18 was part number I think. Sounds a bit better but not as happy as I was with my 05 rt with BA system. I am to old to have to crank it just to get some bass response all the time. Even better half says stereo sounds like it's out of an old pontiac safari from the 70's at low volume. Wow, and here I thought somebody must have jacked with the speakers in the Magnum, because mine sounds crummy too - it's also got the Kicker subwoofer. Seems like all I hear are tinny highs and way disproportionate amount of bass. The factory setup in my 300 sounds so much better, which was surprising. The 300 came with option codes RAK for AM/FM/6CD/cassette, RC6 6 Boston Acoustics speakers, RD7 276 watt amp. I swapped the RAK for an REC later. Just to clarify mine has living loud package too. 77kick18ab was the amp swap. Let's you change sound stage a bit with a surround type sound. Better but not great. To the OP. What model of head unit do you have installed? Bottom right of the head unit, 3 small letters. Is it RER or something else? Is the OEM BA amplifier installed? It's by your knee on the drivers side behind the lower panel. As a note to all, the parts used in the 300 with a BA system and the REC are identical model for model. The difference is the sub enclosure where the 300 is shelf mounted and the Magnum has an enclosure. The Kicker system has a sub enclosure in booth cases. I just installed an RER head unit to replace the REC and think it sounds pretty good. Better than the REC for sure. so I picked the standard radio one. Fortunately, I don't listen to the radio at all. All my sound is provided by Solo Exhaust. I wanted the NAV, the wife does Real Estate and I didn't want her looking at her phone while driving. The Jeep GPS is fantastic, that's why I am so surprised that the Magnum is junk. There's a generational jump in the GPS unit for LX cars when you compare 2008 to 2011 as well; it's not just the Jeep. In the cases where I've helped members upgrade from BA to Kicker, the feedback has been that the BA system is "muddy" and the Kicker system (with OEM subwoofer) is more balanced. Keep in mind that the curve is calibrated so the subwoofer output gain experiences a "roll off" condition at about 22 and stays flat above 28. For those who are still not satisfied with the Kicker 77KICK18 amp and Kicker speaker upgrade, I've have some very good feedback, from members, that the Infinity Kappa line fits the bill. Keep in mind that the front door speakers are MID BASS 6x9's.... not full range... and that ALL the speakers are 2 ohm, each. Rear Speakers: Right side is out of phase from the left side. There are no full range speaker outputs, from the cabin amp. At the cabin amp, there are no RCA outputs. It's all MOLEX connectors and wires. There is a very good wiring diagram, in the OEM service manual, that shows the pair of wires dedicated to the sub output, in the OEM BA and Kicker amps and the upgrade 77KICK18AB amp. Just in case you want to add an aftermarket sub, with OEM bass control. Last edited by diboblo; 11-11-2015 at 12:47 AM.